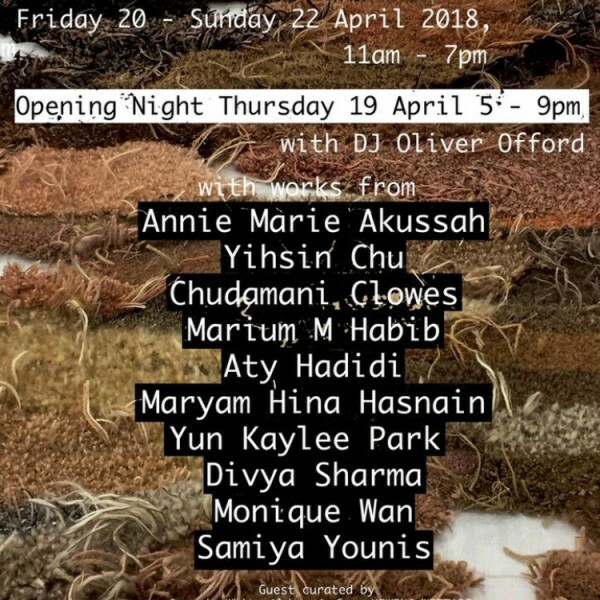 Guest curated by Georgina White-Aldworth from HEWING WITTARE ‘Neulinge’ is a show that will consider reciprocities and relationships between the practices of 10 Artists, Annie Marie Akussah, Yihsin Chu, Chudamani Clowes, Marium M Habib, Aty Hadidi, Maryam Hina Hasnain, Yun Park, Divya Sharma, Monique Wan, and Samiya Younis. Using paint on canvas, clay, textiles, wooden sculptures, film and projection, each artist has created works that have a very physical and bodily presence in the space of The Crypt Gallery. This collection of works, born out of the artist’s hard labour, demonstrate a harmony of texture, scale and form. ‘Neulinge’ translates from German for newcomer. Germany is a country that has been seen as leading the EU in response to the migration crisis and in 2015 the country granted protection to the highest number of first time asylum applicants. In the UK today, newcomers arrive desperately needing help and protection, whilst current residents have lost confidence in a government whose focus is on what ‘type’ of exit from the EU they will negotiate rather than on everyday issues needing to be addressed.